"A real feel of a Muddy Waters band... This band is tight," writes Bman's Blues Report of the Steve Lury & Andres Roots album "Live In Lerwick", and in Cashbox Magazine Canada, Iain Patience adds: "A very good, sound album with a fine range of material, varied in texture and tempo and featuring rock-solid guitar and harp work throughout." 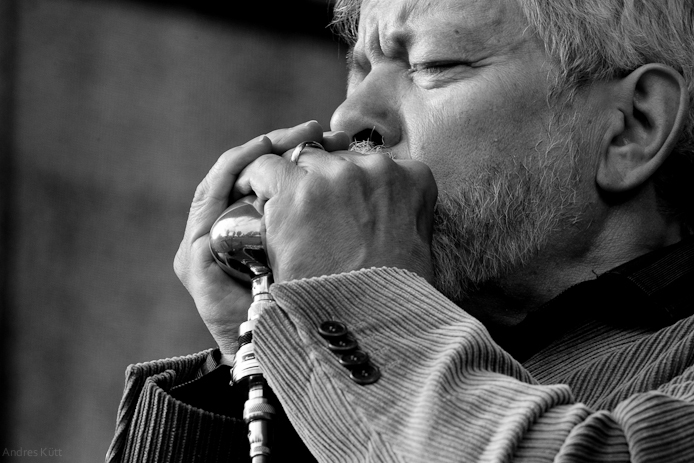 Playing and touring since the 1960's, British harmonica wizard Steve Lury first met and jammed with Andres Roots in London in 2006. Appearances at festivals such as Baltic-Nordic Harmonica (EST), Augustibluus (EST) and Suwalki Blues (PL) soon followed, as did tours of Estonia, Finland and the UK. Those early collaborations with Roots' then band Bullfrog Brown are documented on the 2009 album "Bullfrog Brown with Steve Lury". In 2011 and 2012, Lury & Roots toured Estonia and Finland as Steve Lury & Andres Roots Roundabout. The shows included festival slots at Viru Folk (EST), Pärnu Bluusipäevad (EST), Kaavi Blues (FIN) and Leppävirta Blues Picnic (FIN). "The best this year's Blues Picnic had to offer. Lury's harmonica sawed and hugged, tore and grabbed with the soulful sound of warmhearted and spine-tingling blues," wrote Finland's Jazzrytmit magazine of their Leppävirta performance, reprising their praise for Kaavi Blues: "Roots is a super-skilled guitarist and we saw fantastic proof of that during yesterday's concert. The band's performance was probably the finest we witnessed all day: confident, masterly and compelling." 2013 saw the release of the Lury/Roundabout single "Someplace Nice/Spider In My Bed", the former track also included on Vol. 1 of Wasser-Prawda webzine's 5th anniversary compilation in Germany. In September 2013, Lury, Roots and ex-Bullfrog bassist Piik gigged in Scotland as a trio, with Paul Archibald (UK) sitting in on drums for the Shetland Blues Festival's Muddy Waters Night programme. Lury & Roots' two nights at the Mareel in Lerwick were recorded and released in 2014 as Steve Lury & Andres Roots "Live In Lerwick", courtesy of Shetland Arts Development Agency. In 2017, Lury & Roots toured Estonia as a duo.